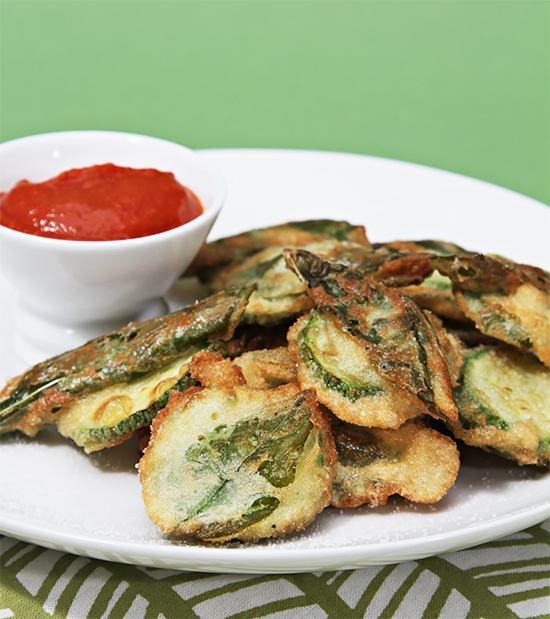 These little fritters are the quintessential summer appetizer or hors d’oeuvre. Adults love them, kids love them, even picky eaters love them. They’re as addictive as they are easy to prepare. 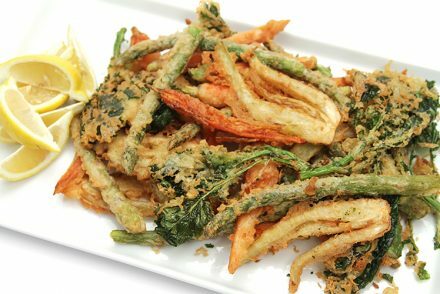 The basil leaves become crispy as they fry, while the lemon zest adds a bit of zing to the batter. But that’s not all: this recipe is also extremely versatile. Try substituting the zucchinis and basil with baby eggplants and fresh mint… or okra with purple basil… or sweet peppers with sage. The possibilities are exciting. How about a crisp Prosecco from Veneto – or this spunky fresh tomato Bloody Mary with garden herbs and celery bitters? Step 1: For the batter – Mix flour, salt and pepper in a large bowl. Add the water and whisk until batter is smooth. Cover and let stand at room temperature for at least 1 hour. Step 2: To make the fritters – Whisk the egg into the batter until well blended. Add the zucchini slices, basil and lemon zest and stir well, separating the zucchini slices so they’re well distributed through out the batter. There should be enough batter to just coat the ingredients. Step 3: Heat a large heavy-bottomed skillet to high heat. Add enough oil to the pan to come 1/8” up the sides. Grab one slice of zucchini and 1 or 2 pieces of basil with a spoon (Fingers help with this job too!) and drop the fritter into the hot oil. Repeat so that the fritters lay in one layer in the pan. Do not overcrowd the pan or the fritters will stick together and it’ll be harder to flip them. Sauté the fritters for 2 to 3 minutes until golden-brown. Flip the fritters and continue to sauté for 1 to 2 minutes until golden-brown. Remove from pan and drain on paper towels. Repeat until all fritters have been used, reducing heat to medium-high when the pan gets very hot so the oil doesn’t burn. Sprinkle the fritters with sea salt to taste. Place fritters in the center of each plate. Spoon the tomato coulis next to them or spoon in individual serving bowls. Serve the fritters piping hot. Cook’s note: These fritters also make a fabulous finger food. 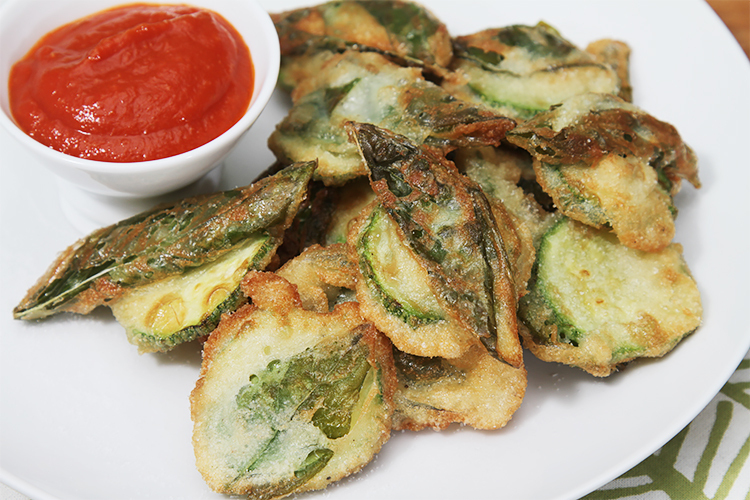 Serve them on a large platter with the dipping sauce in the center. Cook’s note 2: Using baby zucchinis is essential for this recipe. Larger ones have too much moisture. They’ll get soggy as they cook and cause the hot oil to splatter. why?you are so smart in idea of food i love the way you think soooo.. good and so easy to do ,thankss for your idea !!! I bet these are super easy to eat. Love the pairing with the Mojito. Oh what a great idea! I just got some zucchini from my CSA and was looking for ideas- thanks! These look sensational. I wish you’d open a restaurant. I’d be there very night! just fantastic, this looks absolutely fabulous! I have to make these for my dad’s retirement party! great job, I buzzed ya! Leila! Thank you so much dear – I’m so grateful for the buzz! Have a great time at your father’s retirement party and be prepared to make lots of these fritters… They disappear pretty quickly! Thank you so much for stopping by and for your comment. I am sorry that your CSA is picking full grown zucchinis! 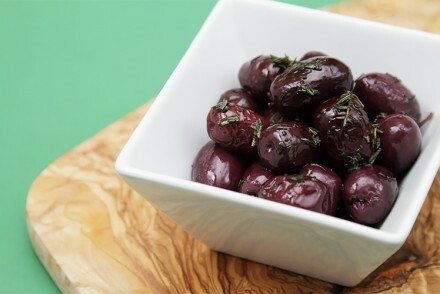 They are not as flavorful when fully grown and also have so much moisture. The first thing I would recommend is for you to talk to the farmer and ask him/her to pick the zucchinis when they are young, at least some of the time. You can try making the fritters with your adult zucchinis, but use the smallest ones in your batch and cut the slices in half (down the middle). It’s helpful to have a splatter mesh screen so that you do not get hot oil on yourself and all over your stove – but please be very careful!!! It will splatter when you turn the slices over. Other ideas: ratatouille, grill slices and serve them as a side veggie (very yummy! ), julienne raw zucchini and toss with the classic pasta with garlic and chili peppers (toss the zucchini in at the end so that you actually don’t cook it at all)… There are lots of great dishes you can make with your harvest! Keep me posted and happy cooking! those fritters look amazing! and what a wonderful use for all the zucchini we always have this time of year! absolutely loving this idea.. the fritters looks light. Frying basil in that way is completely new to me. love it! 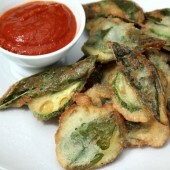 This is a great idea for summer,i had little garden zucchini,basil,tomato etc, and i’m ” fritters” fan 🙂 i will definitely try to make this fritters with tomato coulis sauce, i use alot of shallot for my cooking too. Yum! I love this delicious and creative use of zucchini which a lot of us tend to have lots of during the summer months and need new recipes for ;)! Will have to try this! This looks delicious! 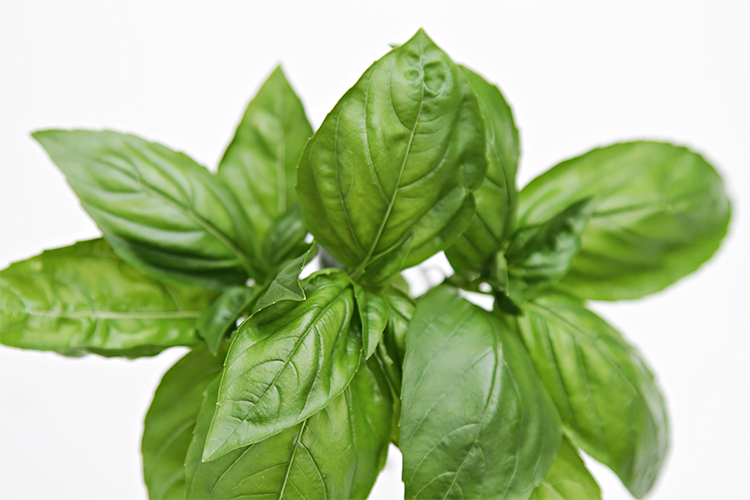 I have an abundance of basil and will definitely be making this recipe! Yum!!! Oooo; I think I need to go buy some Zucchini now 😀 I already have the basil. Thanks for sharing this! Buzzed! i love this idea of frying it all together – thanks for sharing with us!